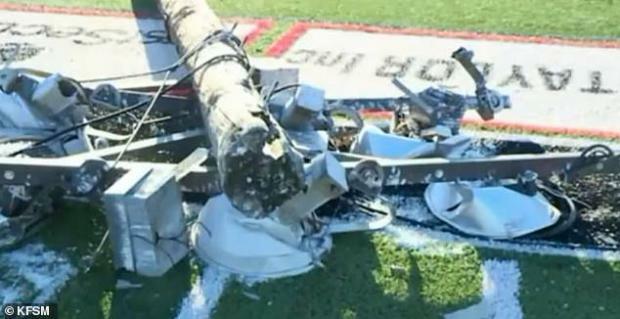 The entire pole toppled over during the middle of the match in Clarksville, Arkansas and almost struck three players, including a referee with deadly force. Just a second or two later and several people would have almost certainly have been killed as they were standing in the exact spot the lighting rig smashed down. In the end, the referee managed to escape with just a broken leg after being floored by the giant pole. A player who was also hit suffered cuts to his head and legs, according to KFSM. The station reported that several school districts were present at the 'soccer jamboree,' and when the light pole fell, students from Mena and Dardenelle high schools were on the field. Authorities are blaming high winds for part of the reason the lighting pole appeared to topple over.